Military training areas, shooting ranges. Runway lanes and signal markings on them. 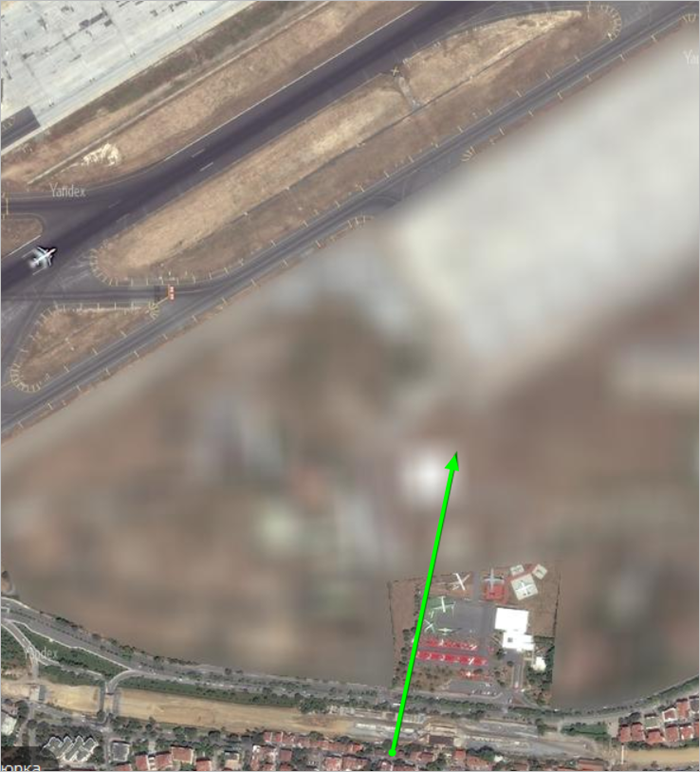 Service roads or special-use roads that are located in the restricted (service) area of the airport. Railway stations located on military bases and in similar territories (example in Russia: closed cities overseen by Rosatom and the Ministry of Defense). Gas pipelines, oil pipelines, other pipelines, water mains, electric poles, other electric transmission lines. This ban doesn't apply to buildings on the territories of the previous type of item. Physical divisions along state borders. Do not draw in territories where satellite images look “blurry”. You can't edit map items that were already created on these territories. The item type, proper name, number or other ID — for military bases (including military units and cities), as well as similar items such as closed cities overseen by Rosatom and the Ministry of Defense. The item's connection to secret service organs (for example, the FSB, GRU, SVR, etc. in Russia). You can not specify what assignments specific buildings are engaged in on military territories (which include military units, bases, and cities such as the "closed cities" overseen by Rosatom, the Ministry of Defense, or the Reserves Training Center in Russia). However, this is allowed in cases where an item's technical features are part of its official or accepted proper name. For example: Mill-5000. When talking about rapid transit in ski resorts, you can also include location height in its station names if that information is included in instruction materials (guides, booths, pamphlets, etc.). For example: Fairytale 1835 m.
You can not name functioning navigation- and geolocation-related map items. Draw them as buildings classified under the “Non-residential buildings and facilities” type (see section 3.4. Buildings). Non-working lighthouses are additionally marked as “Location” items of the “Attraction” type. Naming separate buildings for vent shafts, mineshaft collars and adits. Assign the “Non-residential buildings and facilities” or “ Industry” attributes to these items. Naming industrial docks, slipways, and shipyards. These are water transport stations assigned the “Pier” type.